Etymologically Srinagar is composed of two Sanskrit words, namely, Sri (meaning abundance and wealth) and Nagar, which means a city. Thus, the word Srinagar signifies a place of wealth and abundance. 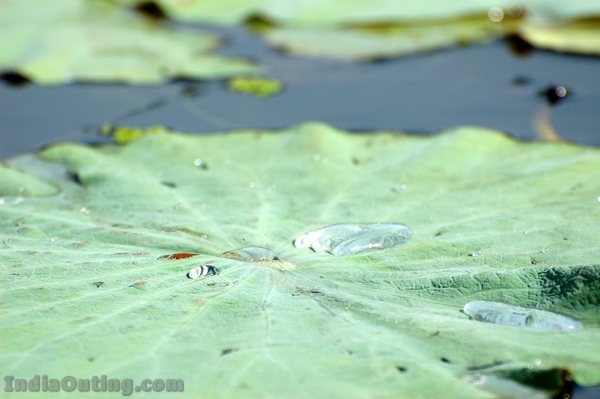 Sri is also the name of a goddess Lakshmi of Hindus. 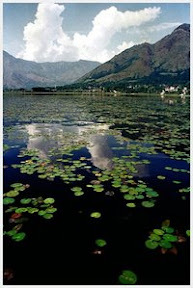 A legend, as incorporated in Nila’s Nilmatapurana, states that the Kashmir valley was a vast lake. 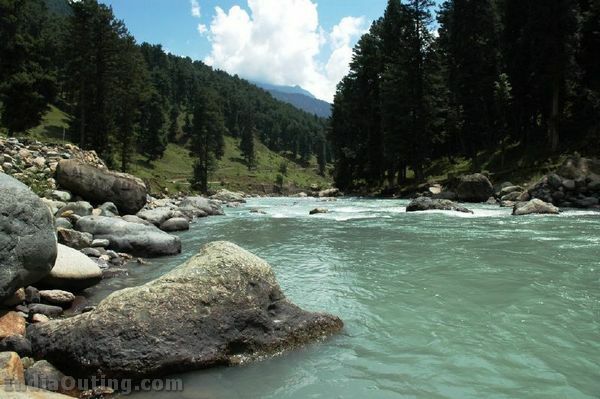 A Hindu sage named Kashyapa drained out the water, and there emerged the beautiful valley of Kashmir. 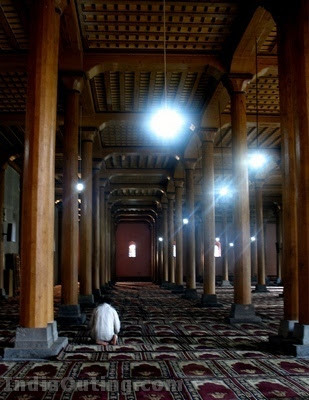 The city was founded by the King Pravarasena II over 2,000 years ago, and the city of Srinagar has a long history, dating back at least to the 3rd century BC. The city was then a part of the Maurya Empire, one of the largest empires of the Indian subcontinent. Ashoka introduced Buddhism to the Kashmir valley, and the adjoining regions around the city became a centre of Buddhism. In the 1st century, the region was under the control of Kushans and several rulers of this dynasty strengthened the Buddhist tradition. Many people take the train to Jammu followed by a taxi or bus ride to Srinagar. The journey from Jammu to Srinagar in costlier in the summers because capital is being shifted from Jammu to Srinagar on both the state buses and Sumos. State buses are safer but take more time and are a bit uncomfortable. Foreign travelers on visas are required to register upon arrival at the airport or to their hotel or houseboat. By air : Flights are operated by Jet Airways, Air Deccan, SpiceJet, Kingfisher Airlines, Go Air, Jet Lite and Indian Airlines  from Delhi and Mumbai to Srinagar, with or without a stopover at Jammu. The frequency is once or twice a day by each airline. The cost is approx Rs. 2,500 from Jammu, Rs. 2,500-5,000 from Delhi one way and higher from Mumbai, depending on the season. The airport is still quite small but the expanded terminal is expected to open soon. All flights originate in Delhi or Mumbai, pick up passengers and then return. It is also still heavily fortified and expect to see many soldiers with guns. Winter flights can easily be canceled due to weather conditions. Tickets are easy to purchase in town, but the airport requires a ticket for entrance. A taxi into town should be Rs. 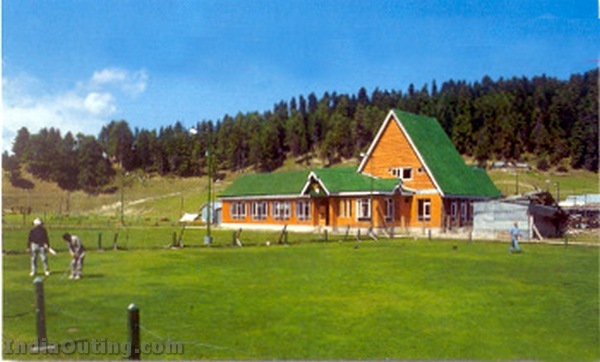 350 and direct to Gulmarg is 1,200-1,500. By taxi : Hiring a TATA Sumo SUV (fits up to 9 people, or 5 comfortably plus luggage) from Jammu costs approximately Rs.1,900-2,700 depending on time of year or even time of day. To reduce costs many people choose not to take an exclusive taxi, and share the Sumo taxi with other travellers. This costs about Rs. 150-400 per person. For a comfortable trip, try for a seat in the middle row – the front bucket seat is (sometimes uncomfortably) shared by 2 people, and the far back could be quite bumpy as the highway is full of mountainous roads. The journey takes around 8 hours. By bus : J&K SRTC operates fairly comfortable buses from Jammu costing around Rs 150 and do the journey in around 12 hours. 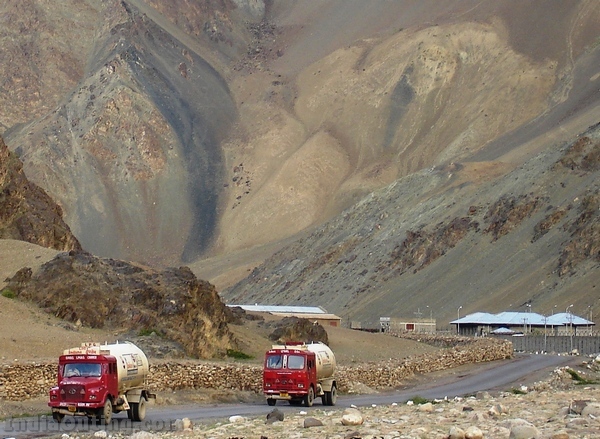 2 day buses run between Srinagar and Leh staying overnight in Kargil.There are also direct buses from Delhi taking almost 24 hours to reach Srinagar. The Mughal Gardens. 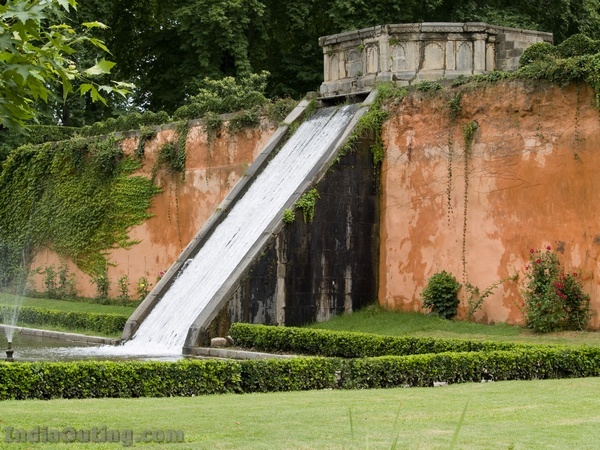 With terraced lawns, cascading fountains, paint-box-bright flowerbeds with the panorama of the Dal in front of them – the three Mughal Gardens of Chesmashahi, Nishat and Shalimar are the Mughal Emperors’ concept of paradise and are today very popular places for picnics and excursions. The beauty of these gardens is at their best during spring but the Mughal structure of these gardens lends them a unique sense of beauty even when the flowers are not blossoming. Nishat Bagh. 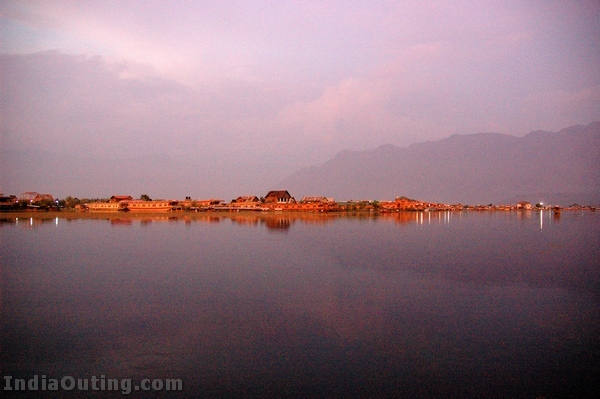 Situated on the banks of the Dal Lake, with the Zabarwan Mountains as its backdrop, (11 km. from TRC), this ‘garden of bliss’ commands a magnificent view of the lake and the snow capped Pir Panjal mountain range which stands far away to the west of the valley. 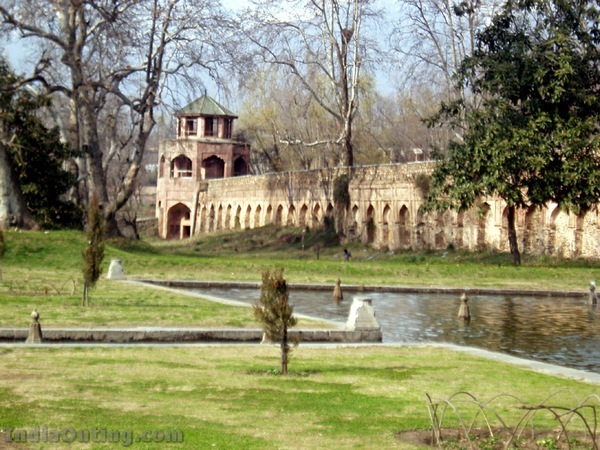 Nishat was designed in 1633 AD by Asaf Khan, brother of Nur Jehan. 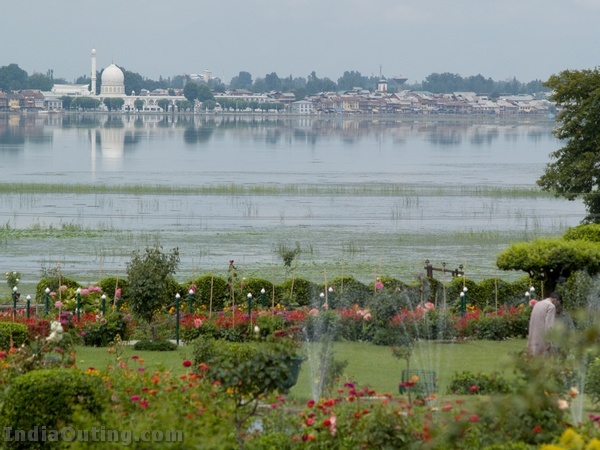 Shalimar Bagh, the Moghul garden in front of the Dal lake built by Emperor Jahangir. Chashmashahi is another beautiful Moghul garden. 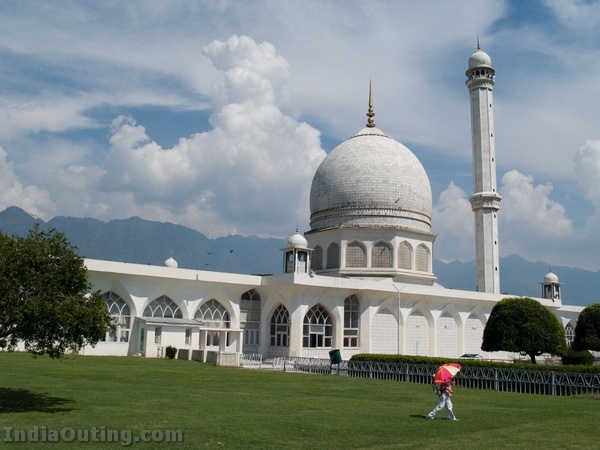 Hazratbal Mosque, the white mosque is breathtakingly beautiful but be careful, as women can enter only the first part of the mosque. Ziarati Hazrati Youza Asouph, in the Khanyar area, about 150 meters NW of Dastgir Saheb mosque & shrine. 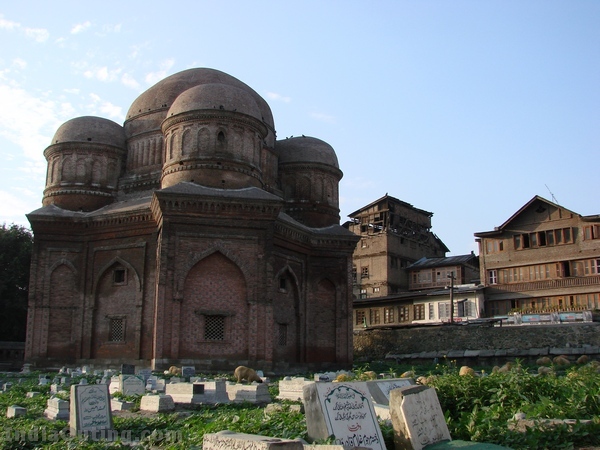 This tomb, also known as Roza Bal, is believed by some to be the tomb of Jesus (part of the larger theory that he survived the crucifixion and made his way to Kashmir where he lived until at least the age of 100). It has been made popular by recent books such as Jesus Lived in India by Holger Kersten among others. It’s down a little side road – ask around, pretty much anyone in the area can point you in the right direction. Shankaracharya Mandir, is a Hindu temple dedicated to Lord Shiva on a hilltop. It can be reached by a car or taxi. For security reasons, no cameras or cellphones are allowed within the temple and you are supposed to leave them in the vehicle before entering the temple premises. Cigarettes, liquor are to be deposited with the police personnel before the ascent of the hill as these items are against Hindu religion. You can buy nice leather products, or jewellery. Cashmere (Pashmina) shawls have been manufactured in Kashmir for thousands of years. Pashmina Shawls are very popular items for sale in the Valley, but make sure to test the quality before purchasing. The test for a quality pashmina has been warmth, feel and the passing of the shawl through a wedding ring. Secondly, the weave pattern on a good Pashmina is fainter than on a “silk Pashmina” or other wool Pashmina. You can also buy embroidered felt mats called Namdahs but the colours of the wool may be a bit too bright in most shops. The Government Emporia supplies might be better than the other private shops. There are also chainstitch rugs in two styles – English design or Kilim design – it will be evident what is meant when you see them. Paper Machie products are also quite unique to Kashmir with colourful motifs and design on them. Kahwah is a traditional green tea recipe from Kashmir. The tea is made from green tea leaves with saffron strands, cinnamon bark and cardamom pods.Some varieties are made as a herbal infusion only, without the green tea leaves. Generally, it is served with sugar or honey, and crushed nuts, usually almonds or walnuts. There is another form of tea that is quite famous amongst the locals, its called ‘Namkeen Chai’ or ‘Nun Chai’. It is pink in color and is also called Pink Tea. It is made from black tea, cardamom, various spices, salt and bicarbonate of soda. Also people like nune toath and dum toath which are very famous among sufis. Nunetoath is nunechai without milk and Dumtoath is strong form of Kahwa. This is a nice place to be in. Any organised tours there? nice pics yar, very nice to see that kind of pics to have a pleasant day. im radhika from andra pradesh, presently working in mumbai, nice pics yar, very nice to see that kind of pics to have a pleasant day, hope most of the people like to see nature na, great pics see n enjoy. very nice place, i like very much. kashmir is truely beautiful the heaven on earht i love becoz i am a kashmiri too. Peace and Tranquility can be felt at just seeing the pictures. Nice place to visit.I love srinagar. 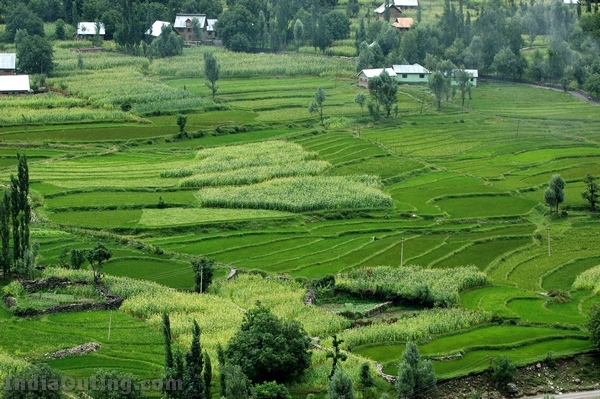 nice photos jammu kashmir thans 4 u. 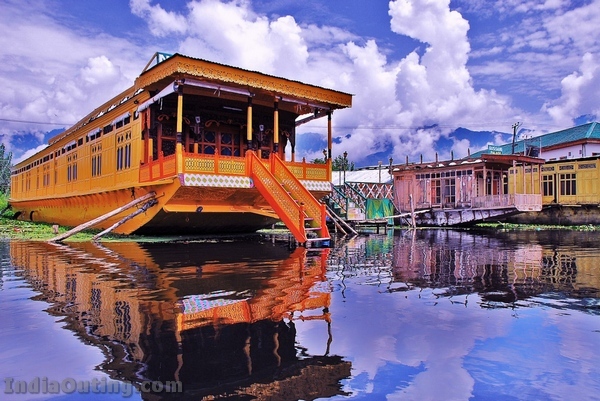 The pics here are not the best ..im sure u will find kashmir much more beautiful than these pics…Being a kashmiri myself i can bet on that …..
GOD KNOWS – WHEN I WILL BE ABLE TO VISIT THIS LOVELY PALCE? I have been to Kahmir. Kahmir is a beautiful place in India. It was the world second tourist place after Swizzerland. But, after erruption of terrorism in Kashmir, tourists were restricted to visit this place. I hope terrorism in Kashmir would end completely and previous glory will return back. A very good place……something not to be missed..!!!! 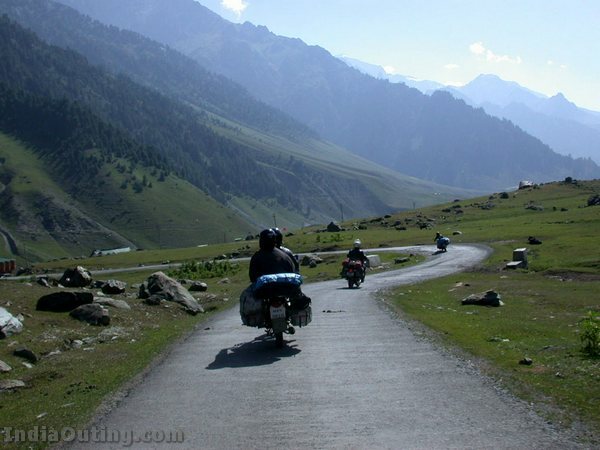 stayed in kashmir for 4 years….heaven on earth and best tourist destination in India. when shall we go there?i start for packing? Its an absolute heaven on earth. It is an great asset of India. A must visit place for all our countrymen. “Saare jahanse achcha Hindustaan Hamaara”, Jai Hind. Kashmir is really a heaven, but the presence of a huge no. of indian occupied forces have made it a hell. Kashmiris should get thier right of self determination so that this hell becomes heaven again. i cant wait to visit……. What a fascinating expression of nature! I am born and educated in Srinagar. Srinagar has made me mystic and global motivator. may ALLAH bless every one, i am presently in Pune, and dropindg my warm eye drops , this is the pain rather emotional and psycological pain i personally feel. oh …! my Kashmir. the truly paradise on Earth. i love my Kashmir( Pir ware). givinng world a call ,visit Kashmir whole heartedly , meet the people of Kashmir,visit the whjole Kashmir and feel the difference and enjoy the great happiest moments of life. my state is much beautiful than these pi8cs reflect,, these are not even 1% of kashmirs beauty, kashmir is much more beutiful. i wish pics from the polo – view, chishmashahi, the road near Burnhall School should be here as well as they are also cool spots in Srinagar. and most imp–HARIPARVAT,SHANKRACHARYA, SHARADA DEVI MANDIR,ZEETHIYAAR, GURDWARA “CHATHI PATSHAHI’ , MAKDDOM SAHIB , BOTANICAL GARDEN, TULIP GARDEN AND N -NUMBER of beautiful places are missing here. A beautiful place which is a feast 2 our eyes. my desire is to visit this heaven on earth before i leave for the other heaven. truly blissful. god bless the kashmiris. Kashmir wants FREEDOM please leave us. 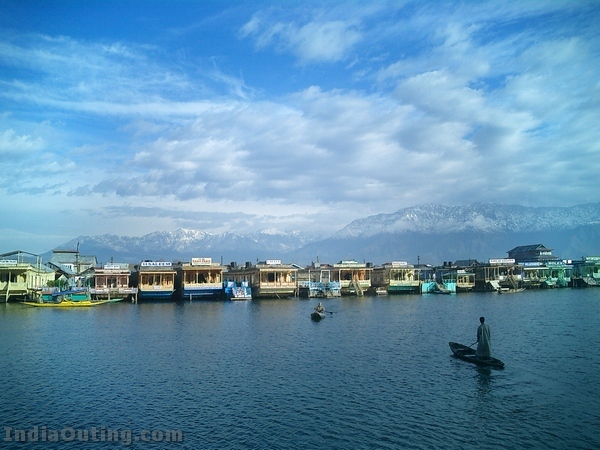 as for the information provided by the website on Srinagar… It has been wrongly stated that Srinagar is the capital of Jammu and Kashmir..
Nostalegic photos. I visted this place twice in 1976 and 1986. Heaven within our range. Wow! I just wanna visit this heavenly place once in my lifetime….hats off 2 the “CREATOR”…..WAT A CREATION! This place looks great love to go there but whats the best tine of the year to go? I am a Malaysian Indian…….Need some friends when I come there. I have been there couple of years before. Its heaven on earth & the stay in a house boat is awesome. 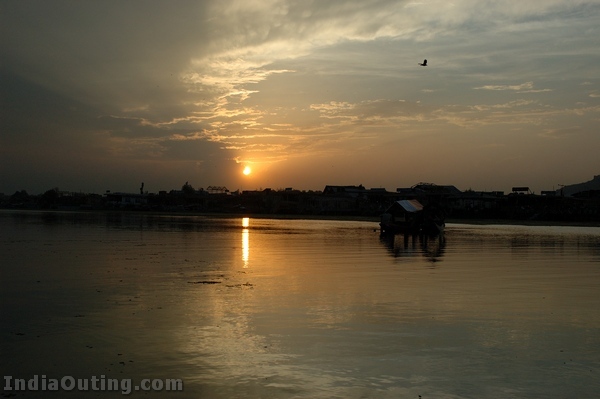 Also surfing the Dal Lake on a SHIKARA is awesome……. Should visit once in a life……. this is one the finest place on earth . in kashmir march to july it is superb to visit there. THE HEAVEN ON THIS EARTH IS NOW CONVERTED TO HELL BY THE SEPERATISTS(ONCE HINDUS CONVERTED TO MUSLIMS).PEOPLE OF THE WORLD SHOULD KNOW WHAT THE CONVERSION TO ISLAM HAS DONE TO A HEAVEN ON THIS EARTH,EVERY BODY IS SCARED TO VISIT KASHMIR BECAUSE OF THESE SEPERATIST /PAK SPONSORED TERRORISTS. THESE SEPERATISTS SHOULD KNOW THAT NO FORCE ON THIS EARTH CAN TAKE AWAY KASHMIR FROM INDIA. beautifull,it’s truly heaven on earth. Sure Kashmir is a beauty but those terrorists should be kicked out of India. Every Indian should be able to buy land in Kashmir. Kick the traitors out. how one can miss such a place my next trip would be this place only. it is very nice, my dream to visit kashmir. Srinagar is not THE capital of Jammu & Kashmir but the summer capital of the state from May to October after which the capital of the state is Jammu from Nov. to April.Thanks. Kashmir is Switzer land of Asia but has been ruined by Exploiters,Expansionists,Greedy Looters for last 60 years.Lets we all Asians force the Expansionists to free the Kashmir which is their basic and birth right and then see its God speed progress.FREEDOM is essential food for the Human survival. 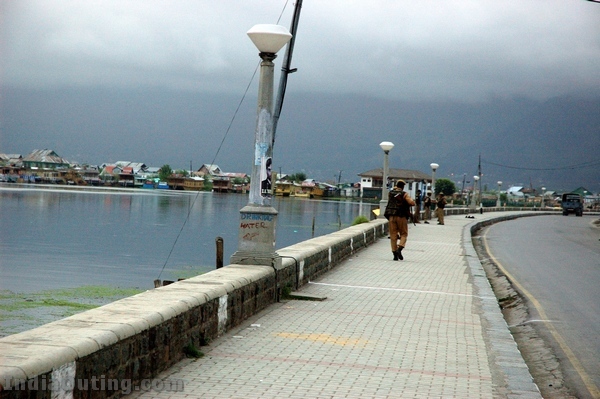 It will be a re-birth if Srinagar is back to normal and the old charm returns to the valley. 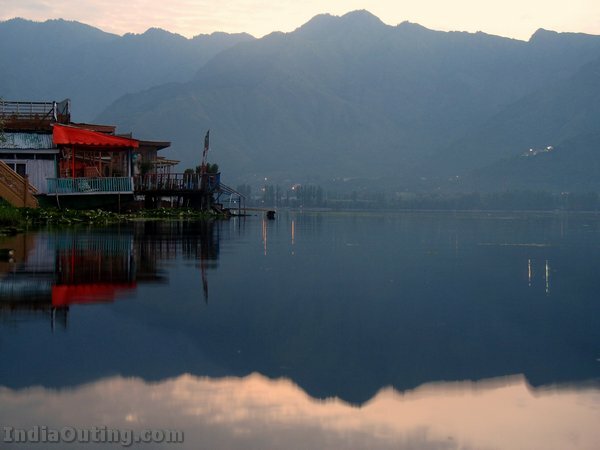 I still remember the good old days about 20 years back when Hotel Shahenshah and Hotel Gulmarg on the banks of Dallake with beautiful interiors and kashmiri good food. Mostly you can walk the entire city casually and observe the city life. If this pictures are recent one then people take the first opportunity to visit this place enjoy the holiday. If you travel by bus then please get bananas and breads for the monkeys. This you will see when the bus traverse from Jammu to Srinagar and take the serpentine route to Srinagar. ITS A VERY LOVELY PLACE. I GO THERE EVERY YEAR FROM 2004 TO YET. 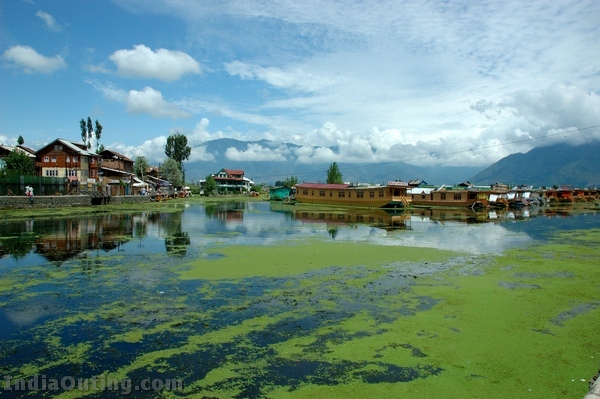 Srinagar is undoubtedly a paradise on earth – everyone should visit this place atleast once in the lifetime. Your lovely narration adds more beauty to the beautiful place in world. May not get an opportunity to visit the place in my lifetime but funonthenet satisfies me. Thank you for sharing. This is updated for the second time but with more details. Thanks for sharing with the beautiful pics and details of one of the world’s beautiful places. Have made up in mind to visit the heaven with my family to share with them the natural beauty inside India. One of the most beautiful places in world and I only wish the terrorism to an end and the peace remain there forever. The nature there gives glory to all but the human denying it to brotherhood. Can’t all religions live as a single society and make that place the best for beauty and peace like many other places in India which have no natural beauty? I have no knowledge about heaven and hell bur this place seem to be the heaven on earth. It is switzerland of India. Feel i can give a better comment to the best place for beauty on earth after visiting once. May god give me a chance to visit there with my kin and kids. 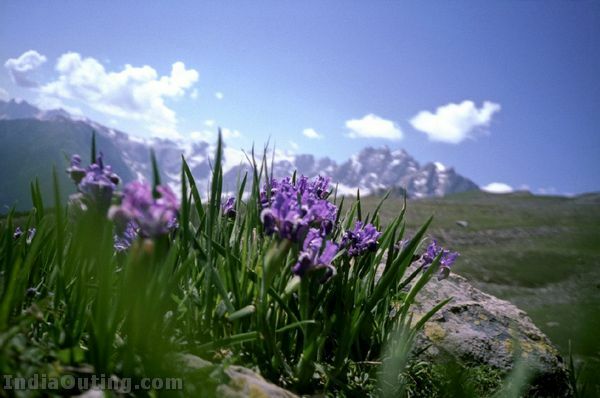 I am actully from Kasmir ,I know how beatiful kaskmir is, but from last 21 years I could not visit to my homeland Kashmir . 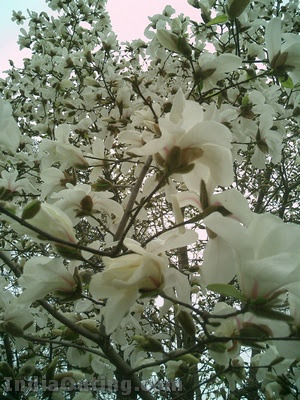 I was very happy on seeing these beatiful fictures . All the pictures displayed on the website are fantastic and charming and gives pleasure. Full credit to the person who has snapped these beautiful pictures. PEOPLE LIKE YOU ARE RESPONSIBLE FOR THE PRESENT SITUATION IN KASHMIR,YOU ARE SPEAKING OF AZAD KASHMIR,GO AND SEE IT YOUR SELF,IT IS WORST THAN HELL . NOT ONLY KASHMIR ,YOU PEOPLE HAVE CONVETRTED THIS BEAUTIFUL MOTHER EARTH INTO A HELL.KUCH TO SHARM KARO. truly heaven on earth !!! What a beautiful place . This is the most beautiful place i have seen so far. Srinagar, gulmaarg .. no words to describe the nature’s beauty. if everyone knows that kashmir is heaven on earth, then why r kashmiris descriminated in india? Heaven on earth undoubtly..Lov to be there one day inshaALLAH. hindustan ki Shan he.bharat ki aan he.sahi me mera bharat mahan he. Surely, a heavenly abode that lost its tranquility under the thumps of Indian military boots!! But for how long! Almost half a century and the sub-continent in ransom. A day of freedom shall eventually dawn and the masses of the sub-continent dis-entangled from the yoke of brahmanic Curse. The pictures of srinagar are really good and facinating. the real beauty of india. Superb Photographs. We are going in July 2010 for 10 days. Pl. provide guidance to make the trip memorable. Hope to see some of you people in Srinagar. The most beautiful place you will ever find. Its pity that some elements have made this heaven on earth into a hell on earth. I hope those people get some sanity and let the world discover the most beautiful place on earth. main 2/3 bar J&K state me gya hn.main pakistan se ho,kashmir meri mother ka mother land hai,waqe me kashnir ek jannat hai. it’s really a heaven. i want to go kashmir. it’s really nice. jab apne india mein heavennnnnnnnnnnnn hai to log bahar ?????????????? jate hai ?????????? So Nice Place To Enjoy Holidays. Definitely I’ll Be There If I Get Any Chance. “Gar firdaus, ruhe zamin ast, hamin asto, hamin asto, hamin asto” (“If there is a heaven on earth, it is here, it is here, it is here”). 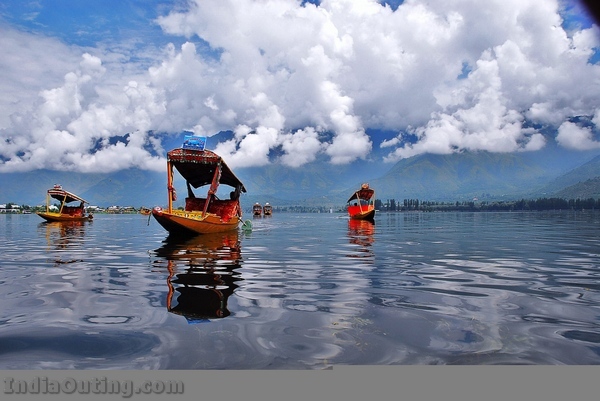 Fantastic,wonderful & Awesome pictures of Srinagar of Kashmir make my eyes coolness indeed. It is a paradise of our country India.